Dry eye condition occurs if the eye is not able to produce enough lubricant / tears. Our eye specialist in the Kuwait specialized eye center use their expertise in evaluating the quality and quantity of eye tears of the patients to plan the treatment. Tears are essential for clear vision and to maintain health of front surface of the eye. Tears provide lubrication, reduce the risk of eye infection, wash away foreign matter in the eye, and keep the surface of the eyes smooth and clear. Excess tears in the eyes flow into small drainage ducts, in the inner corners of the eyelids, which drain in the back of the nose. The symptoms of Dry Eye can be uncomfortable .Basic visual tasks, such as reading, using a computer, driving or watching television may become difficult. Wearing contact lenses may be impossible. Lipiflow is a significant technological advancement in managing evaporative dry eye. With a single procedure, applying a combination of directed heat and pulsatile pressure, many find a single treatment effective in relieving the blockage of their Meibomian glands. The procedure doesn’t cause any discomfort. The LipiFlow Activator (a disposable eyepiece) is inserted under the lower and upper eye lid and is shaped to prevent contact with your cornea. The patient needs to sit on the treatment chair and the treatment takes only 12 min. 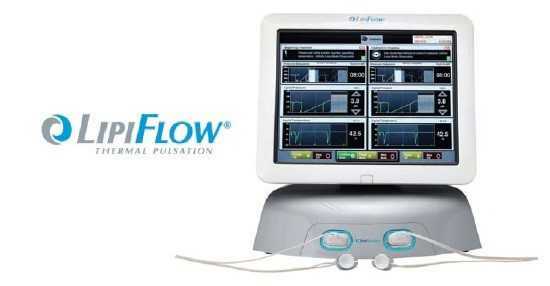 The LipiFlow System is used by your doctor for the application of localized heat and pressure therapy in adult patients with chronic cystic conditions of the eyelids, including meibomian gland dysfunction (MGD), also known as evaporative dry eye or lipid deficiency dry eye. Prior to Lipiflow treatment, the patient should explain the history of eye surgery, eye injury, Herpes of the eye or eyelid or history of chronic eye inflammation. Lipiflow treatment is not suitable for patients with active eye infection, eye inflammation, eyelid irregularity or eye surface irregularity. The Lipiview Interferometer is a prescription device. Prior to taking images of your tear film, advise your doctor if you have used eye drops recently; worn contact lenses; used oil-based cosmetics around your eye; rubbed your eye; recently swam in a chlorinated pool; or are aware of any condition that affects your eye surface and the stability of your tears. These conditions may affect the imaging assessment of your tear film.